As a member of Elemental Theatre Company you have unrestricted access to requesting tickets. 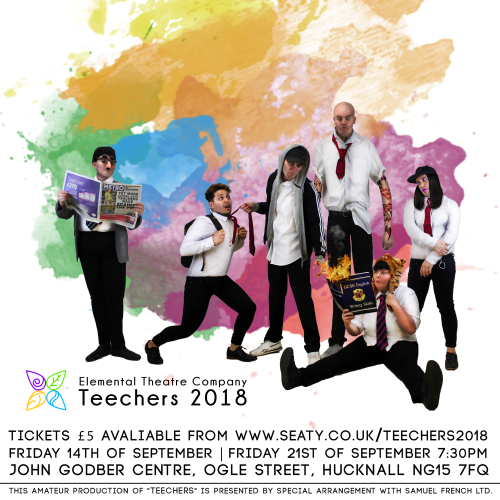 The Elemental Theatre Company would like to welcome you to its first production of Teechers by John Godber, at the John Godber Centre in Hucknall. The show follows 3 school leavers, Salty, Hobby and Gail as they perform an assembly of their time with Mr Jeff Nixon. He is their drama teacher, who ignited their passion for the stage. Mr Nixon believes all pupils should be treated equally. You will be taken to Whitewall High School, it's a special priority area which means it's got a fair share of problems. There are 1500 Kids at Whitewall and they are expecting a new teacher to arrive. Please note that the show starts at 7:30pm. Doors open at 7pm. In the heart of Hucknall, The John Godber Centre is located immediately behind St Mary Magdalene church and is accessed from the road via Ogle Street. There is a large car park at the rear with easy access to the churchyard and high street.